Cluster headache is a primary neurovascular headache. It is a strictly unilateral (one-sided) headache, concomitant with symptoms of the autonomic nervous system in the head. It is characterised by the clustering nature of episodes. Episodes may be provoked by vasodilators, such as alcohol and nitroglycerine. The incidence rate of the disease in the population is low, approximately 0,5-1/ 1000. The first attacks usually occur at the age between 20 and 40. Cluster headaches are more frequent in men (ratio males to women = 6:1) and particularly in smokers. Cluster headache is excruciatingly painful and strictly unilateral. With reference to the intensity of pain, it can be compared to renal colic pain. The episodes usually occur during the night. Although it is more frequently located within or around the eye, it may expand to a larger area of the head and mislead the diagnosis. During the episode, patients suffer so much that they are extremely agitated, cannot stay in bed, pace up and down in the room, sometimes even hit their head on the wall or floor until the pain starts subsiding, usually after 30-60 minutes. The pain is accompanied with dysfunction signs from the autonomic nervous system, such as red eye with tearing, rhinorrhea or/and nasal congestion, even pupil miosis or/and blepharoptosis. The last two signs of the autonomic nervous system may persist and remain even after the end of the episode while the rest of the symptoms subside with the pain ending. In the most typical form of the disease, there are periods with headache episodes lasting from some weeks to months. As for the frequency of episodes, this ranges from one episode every two days up to even eight episodes per day. After such a period, there may be one to two years’ interval before the recurrence of a new attack. In a small number of patients with cluster headache (about 15%), episodes may occur on a daily basis for many years. 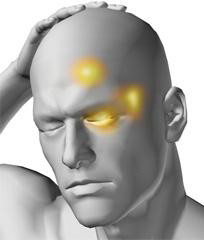 This is the chronic form of cluster headache. The diagnosis of cluster headache is made when taking the history. Supplementary examinations are rarely needed to exclude other causes, because the symptoms are very characteristic and set the diagnosis by themselves. • Sumatriptan 6mg subcutaneously is the treatment of choice, unless there is some contraindication for administrating this specific drug It is the only drug which is effective in treating the acute cluster headache episode. In a high rate of patients, it suspends the episode and alleviates the pain within 5-10 minutes. The use of Sumatriptat is contraindicated in patients with uncontrolled hypertension, as well as in patients who are in high risk for coronary disease and cerebrovascular disease. • 100% Oxygen with 10-15 lit/min flow for 10-20 minutes with a special device and not a rebreathing mask It is a safe therapeutic option, with no adverse events, which stops the episode within 15-30 minutes in 70% of patients. 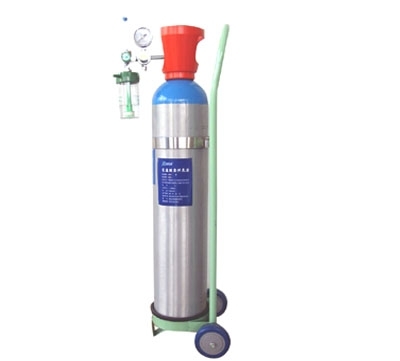 Oxygen bottles with a high flow device 15lit/min are available and prescribed for domestic use. Common analgesics, ergotamine, tartrate and all triptanes administered per os have no place in the treatment of the acute cluster headache episode. • Verapamil 120 to 480 mg daily is an effective, safe and well-tolerated preventive therapy. The most common side-effects are constipation and redness of the face. Electrocardiographic control has to be performed before the administration, in order to rule out atrioventricular block. B-blockers should not be co-administered. • Prednisolone in a dose of 60-100mg, once daily for 2-5 days, gives very often good results with almost immediate relief. Due to potential severe complications that might occur with the long-term administration of cortisone, the therapy is limited for a short period of time: a loading dose is followed by a 10mg gradual reduction every 2nd or 3rd day until the final discontinuation after 2-3 weeks. With the exception of cortisone, the preventive therapy is continued in episodic cluster headache until the patient becomes free of episodes for at least 14 days. This is important to diminish the chance for relapse although there is no evidence that the drugs should be reduced gradually rather than abruptly. In case of relapse, the treatment should be restarted even though it is not certain that symptoms will come quickly under control. Preventive therapy sometimes transforms the chronic cluster headache into a headache of episodic type. 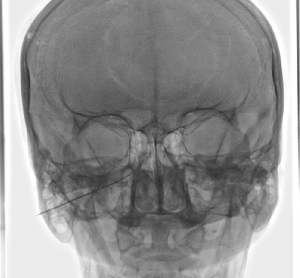 • Application of Conventional Radiofrequency to the sphenopalatine ganglion. 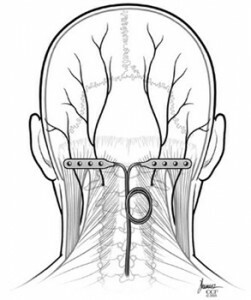 Should the conservative treatment fail to give satisfactory results, then the application of radiofrequency to the sphenopalatine ganglion is indicated. 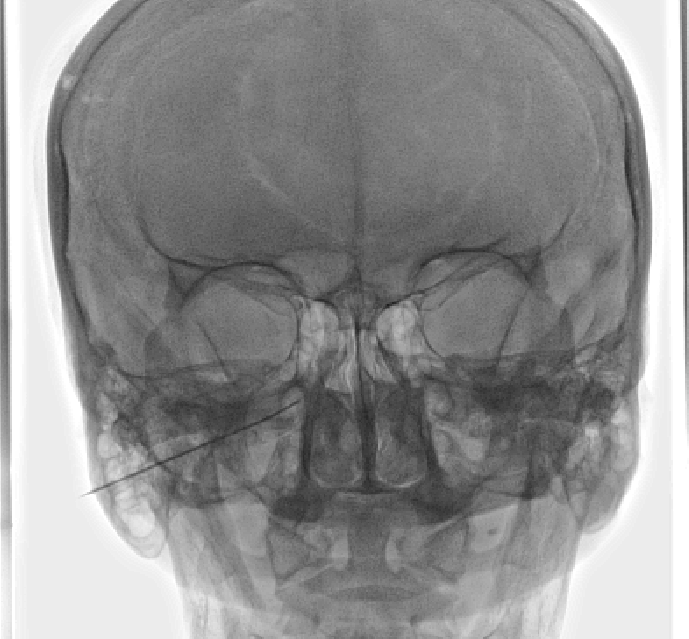 In a retrospective study, patients suffering from refractory cluster headache (56 patients with episodic and 10 with chronic cluster headache) were treated with radiofrequency therapy and were followed up for a period of 12 to 70 months. From the episodic cluster headache group 60,7% reported full relief while only 3 out of 10 with the chronic cluster headache reported the same result. Moreover, another recent study has shown good results with this treatment even in the case of patients suffering from the chronic type of cluster headache. In this retrospective study with a sample of 15 patients, there was reported significant improvement in the intensity and frequency of episodes for longer than 18 months. • Occipital Nerve Stimulation with subcutaneous electrodes in the occipital area and a subcutaneously implanted generator. There is a systematic review for the chronic headache treatment (including also cluster headache). It seems that this treatment minimizes mainly the intensity of pain during episodes. There is a latent period of about 2 months between the implantion of the electrode and the clinical result.